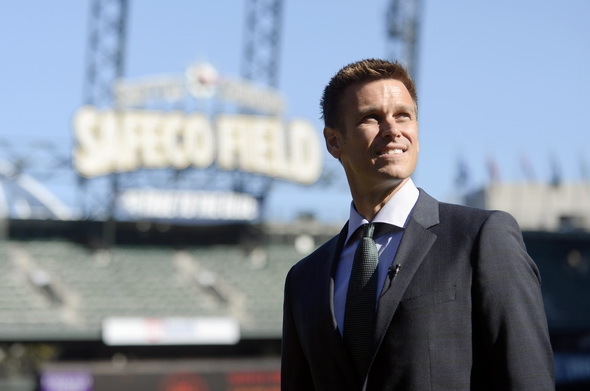 Mariners GM Jerry Dipoto is confident of success for the team in 2017, including acquisitions he made while the pre-spring training luncheon press conference was still happening Thursday. Defending his star pitcher, Mariners general manager Jerry Dipoto said Thursday that Felix Hernandez still can be the ace despite a 2016 season of decline stemming largely from a calf injury, which meant his arm health and pitching mechanics were no issue in 2016. “The demise of Felix Hernandez is being grossly exaggerated,” he said at the Mariners annual spring training luncheon. “He’s still a very good major league pitcher. He had a lower body injury last year. There’s nothing wrong with his arm. Felix Hernandez 2016 looks very similar to 2015 minus the innings he sat on the disabled list. Dipoto said Hernandez would always be compared to his best season, in 2010 when he won the Cy Young Award, a difficult feat for a pitcher to match as he ages. “Unfortunately for Felix, the barometer by which he will be measured is unsustainable for anybody,” Dipoto said. “This is one of the best pitchers of a generation, and they don’t remain that way forever. There’s going to be some fall-off. We are in the age of social media where when there’s first a wobble, everybody wants the sky to fall. Pitching depth was a big push from Dipoto from the time he arrived in Seattle in late 2015. Dipoto spoke to the mound desperation in last year’s 86-76 season that ended out of the playoffs. “Last year we used 31 pitchers and we had 13 starting pitchers take a turn,” Dipoto said. “And 21 different pitchers won a game for us. I talked about depth until I was blue in the face last year until spring training began. And as we got to spring training, we were trying to figure out who was going to be our 12th pitcher. The team emphasized the integration of Dipoto’s “control the zone” philosophy into Seattle’s farm system to make more MLB-ready prospects. As a partial result, the all seven of the Mariners’ farm clubs made the post-season. He’s happy with the 11 trades he’s made this off-season, bringing to 35 his total since he joined the club. The statement prompted one member of the media to ask if Dipoto thought he had assembled his final roster for spring training. “We’re never done,” Dipoto said, smiling. Twenty-five minutes after leaving the podium, Dipoto proved true to his word when he claimed C Tuffy Gosewisch from the Atlanta Braves off waivers, and later traded C Jason Goldstein to Oakland for LHP Dillon Overton and designated C Jesus Sucre for assignment. No one is certain who will still be on Seattle’s roster on Feb. 14 when the Mariners begin spring training. But Dipoto was clear that he thinks the Mariners can do more than pull up two games short in a wild card chase in 2017. “I’d like to make the playoffs,” he said. “And ‘win now’ is always my sentiment. Seeing how the Rangers are having more injury issues and haven’t upgraded their team this offseason, hopefully the Mariners can beat out Houston for the top spot. Tuffy Go Swish is a perfect name for a dude with a batting average well below the Mendoza line. Dipoto was just having himself some fun here. Hard to see this guy making it beyond spring training.